Completely use up art materials. Purchase in container sizes that do not leave lots of residue. 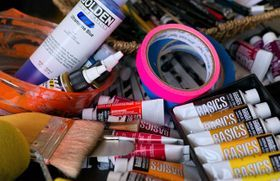 Reuse or recycle art materials whenever possible. Treat hazardous waste art materials by neutralization (see photography section) or other methods when possible to reduce the toxicity of the waste stream. *Use odorless mineral spirits instead of turpentine, kerosene, or gasoline. Dichromates* Use fountain solutions based on water and gum arabic. *Use citric acid as counter-etch. Photolithography*Use positive/negative re-sensitized offset plates. Soapstone or seatite Carve alabaster or cast plaster. *Recycle used paper and cardboard, or use rotten or mulched plant material to about boiling in alkalai. Lye*Use soda ash (sodium carbonate) not lye.